this is perfect for laptops and on-the-go people like you and me. btw, i never liked pldt, solid bayantel ako, never had prob with it. wow ang galing! dapat lang kumuha ka na nyan! go go go! hello. its nice to see a helpful blog like this for Sun broadband. I am already subscribed to this service for two months now and here’s what i got: on the 1st month the speed was just super fast but on the 2nd month (June) the connection suddenly became dial up speed. How I noticed? Im a heavy downloader and now I download on average 60MB-100MB an hour. Last month I averaged 200MB-300MB per hour. 1)	Existing Sun postpaid subscribers add only P649/month to your existing Plan. That’s P150 discount/month on your broadband subscription. This offer is also available to new Sun Postpaid subscribers. Great offer!!! 2)	For those who prefer to only get the Sun Broadband Wireless service, pay only P799/month. Just submit your Valid Identification (SSS, Diver’s License, PRC Card, etc), Proof of Billing and Proof of Income (2 months credit card bills, existing internet subscription bill, and postpaid subscription bill of Globe/Smart/Addict can be used as proof of billing and income.) Other bills like Meralco, Manila Water, Cable TV bills, PLDT/Innove/Bayantel bills can also be used depending with the bill amount. 3)	EASY BROADBAND!!! Now this is the easiest way to get an Internet Broadband service instantly. Just pay P2,500 as modem fee and P799 for the advance MSF and present your Valid ID with address (driver’s license, company ID with address, etc) If there’s no address on your ID, just submit a billing statement (doesn’t have to be under your name) where Sun can send the bills to. For any inquiries, you may call 333 on your Sun phone, dial 3953333 using a landline or visit the nearest THE SUN SHOP outlet. Sun Broadband Wireless is adding more and more 3.5G cellsites in Quezon City, Makati, Mandaluyong, Las Pinas, Paranaque, Bicutan, Pasay, Pasig, San Juan, Marikina, Valenzuela, Caloocan, Malabon, Navotas, Cainta and Antipolo. So this means faster internet service using HSDPA! If you’re using a 3G phone, turn on the UMTS/3G network feature under Network Settings and manually search the network to check if you have Sun Cellular 3G signal at your place. In places not covered by Sun’s 3G service yet like Cebu, Davao, Batangas, Cavite, Laguna, etc there’s the EDGE service that offers about 256kbps, not bad for just P649/month. This service competes directly versus Globe Visibility, Smart Broadband and PLDT WeRoam that charges at least P1,500/month for unlimited internet. bket ung sun nmin npuputol pag mag lalaro kmi ng online games?send nyo nman s e-add ko ung solusyon s problemang un…. pki ayos namn po ung connection ko kc pag maglalaro n kmi ng online games npuputol n ung connection…send nyo s e-add ko ung solusyon sna mgawan nyo ng praan un…………. Hi, I recently applied for the bundled plan as I already have two Sun post paid lines. a few days later, sabi ko WTF! as na decline daw ako! tawag ako agad and sabi lang nila declined. I found out from my brother who also applied (and declined) that it was due to our income??!! their reasoning is that with our income bracket, we could only afford two P350.00 plans! Now, we are in the 25-30k income bracket. baka gusto nila sampalin namin sila ng pera. not to be mayabang but think of it, if ganun ang income namin and we’re applying for the lowest plan, sino na lang ang makaka afford ng mga services nila? and to think they sell themselves as the cheapest provider. and to top it all off, after the decline, they offered me the easy plan daw nila. and that plan… costs more that what i originally applied for! DUH!!!! Me too…taga-San Juan din ako. I applied for this kasi yung kasamahan ko sabi mabilis daw. Pero nung first day palang ng gamit ko…ang bagal na. I can’t even watch movies. Yun pa naman sana main aim ko. Help me naman please…Is there any other way my internet connection can speed up? Sobrang bagal kasi…hours bago matapos ung buffering. Please help. When I first got my SBW geez, madadala ata ako sa bilis ng service. Imagine, nagbburst siya up to 250-300kbps per download ko except torrents ala dial up ang connection dun. So I was a very satisfied customer then I even have my boyfriend got one for himself na rin kasi for the price napaka-convenient/practical until one night, April 27, 2009 ampotah it dropped to 4.75kbps max na lang ang download ko at napaka-consistent hanggang ngayon June 4, 2009 ganon pa rin. Mga peste, manlilinlang ng customer 100+ times na ko tumawag ng Sun Hotline I have the call escalated to a supervisor 5x na ata or more in fairness wala pa rin nangyari. Pumunta na ko sun shop to expedite the process wala pa rin. guys guys guys! warning lang….kung gusto nyo ng maganda(excellent speeds) for the 1st month tapos dial-up speed the next. subscribe na kayo. when i got my sbw 2 months naman siyang mabilis.. download nga lang ako ng download ng divx movies ah.akala ko ganun lang talaga ang speed. ever since last month hangang ngaun.. lower than dial up na ang speed ko. possible reasons eh congested network, downtime.. etc… possibly kapag itinawag nyo to sa tech support nila ganyan ang sasabihin. take it from me nagtrabaho na din ako sa ISP. inoobserve ko yung connection and may 1-2 hours lang in the morning na yung bilis eh gaya ng dati,oo i could still download my divx movies & my connection still soars ONLY around 7-9am manila time. taga pasig po ako. nandito pa nga ako sa galleria ngaun para itest kung area problem lang eh. hindi pala… to what i think, its with the subscription.sun limits bandwith given to “old” users to give way to new subscribers. yung hindi ko maintindihan eh sobrang limitation naman yun. buti nalang wala akong kontrata with that forking company. hi, can you try mcafee speedometer? gusto ko lang malaman if still the same speed. Don’t get Sun. It’s pretty slow and useless when you need it fast. It’s only ok early morning and almost useless at night with only about less than 100 kbps at night. baka ung speed depende din sa location. i also tried using my postpaid sun sim, gamit ang e156g usb broadband. mabilis ang connection hsdpa as in one click lang. sulit na sulit dahil walang idle time. sinubukan ko din ung usb broadband ko ng prepaid sim, ganon din ang connection. hsdpa pa rin, super bilis. kaya lang napuputol yung connection yung 30 pesos sulit na sulit dahil hindi siya katulad ng globe at smart na once nagdisconnect automatic na 10 pesos ang mabawas kahit wala pang thiryty minutes. ang sun tuloy tuloy pa rin ang connection hanggang maubos yung actual time na 30 minutes for 10 pesos. kahit may interruption ang internet connection, yung load mo hindi nauubos agad. waahhh, la kwenta yang sun broadband! !kala nyu lng yan, ganyan dn kami nung una, 2wang 2wa kami kasi soooper bilis. kaso, after a month or so, nagsimula na ang mga connection problems. Connected sya, pero d ka makakapagbrowse. sayang, nagpaplano pa naman akong magSBW. Though, nakakasagap naman ako 11Mbps sa kapitbahay kaya lang pag nakaoff na sya di na ako makapagnet. kaya balak kong magSUN internet coz i heard a lot of positive reviews sa service nito. anytime anywhere puwede akong magonline, pero mukhang nagdadalawang isip na ako. parang magtitiis na lang ako sa pagsagap sa kapitbahay hanggang sa bumuti ang serbisyo ng mga network yan! sa mga nag pa plano mag-subscribe sa SUN WIRELESS BROADBAND na Unli P799 monthly, first two months ok ang speed at connection nila then after nuon li-limitahan na nila kayo,mas worst saakin ,mabagal na disconected pako every 2hrs…sa fairview Q.C location ko partida malapit pako sa cellsite ng sun pero ano?…WORST!!! i cant even play restaurant city with SBW! BAKIT DI AQ MAKALRO NG ONLINE GAMES?????? PAG NAGLALARO AQ NG ONLINE GAMES NAG LALAG TAPOS PAG NAG ININTERNET NMN ANG BAGAL DIN……..KALA KO PA NMN ANG GANDA NG SUN…………………MURA LNG PLA ITO PERO HINDI MABILIS AMFFFFFF!!!!!!!!!! MANIWALA KAYO OR HINDI.. BULOK TALAGA SUN BROADBAND NA YAN.. NUNG FIRST 2 MONTHS NA BAGO KONG PURCHASE SA KANILA.. GRABE SUPER BILIS!! TAPOS NUNG AFTER 3-6 MONTHS… PUCHA ANG BAGAL, TALO PA UNG MODEM NA 56Kbps… KINUKULIT KO NA NGA UNG TECH SUPPORT NILA KASO WLANG SILBI, LAGING REPLY NILA OKAY NAMAN DAW UNG CELLSITE NILA.. PUCHA MALAPIT NAMAN AKO SA CELLSITE NILA… TAMA NGA, LIMIT NGA NILA UNG BANDWIDTH… MAUTAK TALAGA SILA… SANA PASABUGIN YANG SUN CELLSITE NA YAN TULAD SA GLOBE NA PINAPASABOG NG MGA NPA’s… TSAKA KARMAHIN AT SUMPAIN YUNG NAG LILIMIT NG BANDWIDTH NATIN… YUNG MGA AGENTS NA PURO POSITIVE REPLIES NA YAN, WAG KAYO PALOLOKO… BINABAYARAN SILA KAYA GANYAN SILA… WAG KAYO PALOLOKO!!!!!!! ay sus…. naknang pesteng dami ng problemang hatid ng sun saken…. palaging disconnected kahit di naman… syet nga eh…. tapos ke bagal bagal pa… biruin mo 680KB file na video nakalagay eh will be upload in 33:56’00” . ketagal nun…. wag niyo na ituloy ang pagbili…. what you all should have done to begin with is to listen to the sales person that was assisting you. because they warn you about shared downloading time… if you exceed anything above a said certain amount of mbs the network automatically reads your sim and then throttles (slows) your connection speed. no mobile broadband in the world will allow you to keep on downloading without any limit. dont be so excited like a kid and not listen then to find out that it wasnt you expected. for those complaining pls pls stop look and listen before crossing the railroad. plus there are so many ways to get around this problem…. (warning!!!!) you can downgrade the or openline your huawei modem, if downloading you can download a download partitioner program so the download would be faster…. if all else fail buy another SBW sim card… so much complaining… changing your tsp/ip dont change squat either cause your still using the sim number that is given to you….. wake up!!!!!! SBW user din ako. I`ve been using it for 7 months now (or should i say pinagtiya2gaan ko na siyang gamitin for 7 months now.. hehe).. nung first few months, ok siya.. mabilis. nakakapag-online games nga ako eh.. pero nung tumagal na, siguro after 3-4 months, ang bagal na.. parang dial-up nga. putek! kainis..
palpak ang sun!!! pramis dito sa pasay!!! 100% ang 3G signal pero 0 kbps ang speed!!! asar!!! naka plan pa man din to! WAG NA KAU MAG SUBSCRIBE!!!!!! ADVERTISED SPEED IS 2MPBS pero 0.2MBPS lang YAN!!! Hello! Subscriber din po ako ng sun. Kainis kasi po lagi nadidisconnect. Tingin ko may piling lugar na may malalakas na connection. Kapag gabi wala na ung net ko. Hindi ako makagamit pag gabi. Siguro guys pag may sun lang talaga gagana toh.haha.. Kadalasan nga ko 0.17 kbps lang ang connect eh. Bagal, sobra..
kaasar…same Globe and SUN Broadband are junk!…too slow and can’t even download anything…even a byte…ung SMART nd q pa nmn na try…pero I prefer na mag wired nlng kau…like DSL or anything…K? I’m using Globe Broadband here in Cebu and it works fine but when I’m in Luzon it’s slow. I tried using Sun Broadband too and it’s very very very slow. napaka walang kwenta ng sun.almost 1 1/2 months na ako nag co2mplain sa internet connection ko..panay follow up nlng daw nla ung problem..nakaka bwisit na sila..wag na kau mag sun broadband..mag sisisi lng tlga kau sa service na bnbgay nla..
woooooooooooooooot.naiintindihan kita admin pareho tau ng problem 100% signal pero speed ay up top 300kbps madalas ummabot lng 200kbps….eto speedtest ko na na tsambahan ko lang yan medyo ok.hahaha!guys pede ren ba message nyoko sa facebook:Angelo Louie N. Jimenez(ung naruto na picture)kung may alam kau “PAMPABLIS”ng SUN BROAD bAND OR INTERNET.na GUMAGANA. im a sun bro wireless subcriber. so far maganda at mabilis naman ang connections nya. sa pag DL umaabot sa hapon at madaling araw ng upto 88KB/s nakakapag youtube din ako ng maayos sa piling oras lng. pero sa ibang oras, mejo mabagal umaabot lng ng 15KB/s upto 22KB/s pero ok pa din ung speed na yun. All in all maganda ang takbo ng service nila dito sa Quezon City near SM north edsa ang place ko. hahah walang kwentang sun broadband na to. ka ka subscribe ko lang last june 14, 2010 P799/month unlimited. pinagsisihan ko tlaga kung bakit pa nag experiment pa ko sa network na to, you tube or even music download walang kwenta, buti 3 months contract lang pinili ko so antayin ko nalang matapos ipapa disconnect ko, balik ako sa smartbro P999/month yung may antenna super ang bilis wala me masabi. nasunog kasi place ko dati kaya close account yung smartbro ko. Sun Broadband Wireless is nothing but just a piece of crap! amf, ano ba yan, lagi akong nadidisconnect! WAG NA KAYO MAG SISIGN UP NG SUN CELL WIRELESS BROADBAND! i am a blogger, and i’m using pldt dsl, then i switch to sbw kase laptop na gamit ko.. sabi up to 2mbps ang speed, try ko sa sun kung ok kahit .9mbps ok n sa akin. kase puro streaming ang blog ko. nung nagtry ako i-test sa pc nila oo ang bilis. then kumuha ako ng 799/monthly. pero ang bagal talga 34kbps-300kbps lang ang speed. gusto ko sana magtry sa smart. ano sa palagay nyo guys? mas ok kaya ang smart? P.I na SUN yan… binebenta pa.. nalinlang ako.. mura nga.. eh prang ung bbyaran mo per month dito.. 1hr. lng sa computeran… hnd nmn nkakatipid.. nbabadtrip lang ako nung pnilit ko pa GF ko na SUN nlang kesa GLOBE.. mag sara na kayo.. SCAMMERS!! 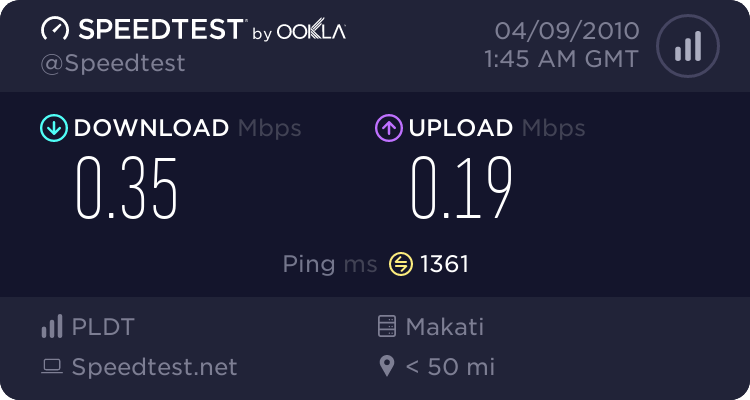 sa umaga lng tlga sya mblis.. pero im not really contented.. ksi online gamer ako.. mdming tao na nagsasabi na mbilis dw kesa sa lhat ng wireless broadband.. pero before ako kumuha ng sun.. nang hiram ako ng globe broadband … mbilis pti download speed pwde na.. prang dsl tlga.. pero bumili na ko ng sun.. super disappointed ako… kala ko mas bibilis pa.. un pla 50x mas slower kesa globe.. grabe..
im from davao, and depending on location the speed drops during daytime, but i don’t experience downtimes esp i play online games. during midnight till 6 or 8am my speed shoots up to 3mbps. so i think your location is the problem. and try to check on your settings. it might help. instead of recommended used the preferred connection like the wcdma connection. WAG NP KYO MG-SUBSCRIBE S SUN BROADBAND WIRELESS, WALANG KWENTA at SCAMMER lng ang 2MBps n speed, ang makuha nyo ay 0.2MBps lng!!! Excited p nmn kmi ng misis k n mgkaroon ng SUN Broadband wireless, nung unang araw plang napakabagal n ng connection 100kbps or 0.1MBps lng ang nakukuha nmn speed s NAVOTAS hanggang s ika-3 araw, ginawan n daw ng incident report hanggang umabot ng 3-araw wala namang nangyari ganun din kabagal ang speed!!! WALANG KWENTA ANG TECHNICAL SUPPORT NILA at ANG SABI SKN 2 LNG DAW ANG SUPERVISOR NILA!!! WALANG KWENTANG KUMPANYA!!! ung CONNECTION PARANG DIAL-UP LNG, wg kyo maniwala sa advertisement nla. MAG-FILE N KMI NG DISCONNECTION!!! Walangyang yan, kaya pla npakabilis i-processoso ng application nmn at i-no-autodebit p s credit card nmn ung palang siste ang modus-operandi nla n automatic n ma-charge sau ung bill kahit NAPAKAPANGIT NG SERVICE NLA AT SUPER-BAGAL NG CONNECTION NLA!!! WAG NP KYO MG-SUBSCRIBE S SUN SBW WIRELESS 799!!! SCAM LNG P YAN!! !